Riverside HIPPA Compliance Assessments - Los Angeles, CA | Biztek Solutions, Inc. Your all in one solution for HIPAA is here. Everything you need for HIPAA compliance in one place. Guided Coaching sessions help you tackle the stress of HIPAA compliance with someone on your side. Avoid fines, unhappy customers, and the fallout from breaches by creating an effective compliance and security plan. All HIPAA training, Required Assessments, Policies and Procedures, Business Associate Agreements and more! 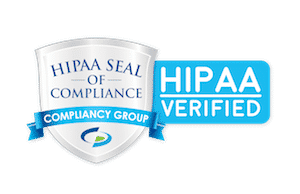 Our HIPAA Seal of Compliance verification allows you to show your visitors you care about compliance. We give you confidence in your compliance with the fact that none of our clients have ever failed an OCR/CMS audit. Our Compliance Coaches are known in the industry for their full support and ongoing implementation of your HIPAA compliance. From day one we guide you through not only how to use the software, but work with you to complete the full regulation from start to finish, every step of the way. “Unbelievably thorough approach to the minefield of HIPAA regulations that no provider can possibly be adequately aware of. Take the stress of HIPAA compliance out of your life once and for all. Ready to schedule your first HIPAA Compliance Assessment? Contact us today!